As Program Coordinator of Garden and Landscape Studies, Jane Padelford supports logistics of a fellowship program, a lecture series, an annual symposium, and a series of installations of contemporary art in the institution’s historic gardens. 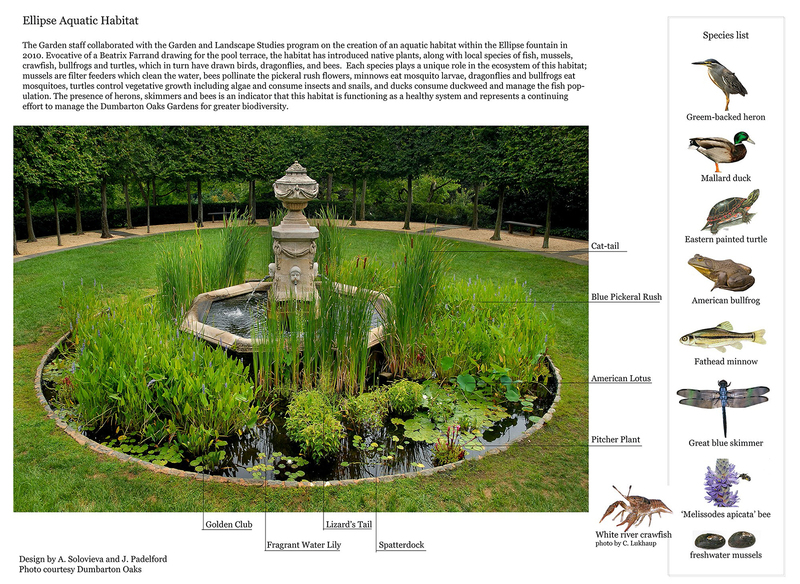 In 2010, in conjunction with the symposium, Designing Wildlife Habitats, and in collaboration with garden staff, she designed the native aquatic habitat in the Ellipse, which has developed into a functioning ecosystem. The presence of a wide variety of species is an indicator that this habitat is functioning as a healthy system and represents a continuing effort to manage the Dumbarton Oaks Gardens for greater biodiversity. Trained as a landscape architect with an MLA from Cornell University, she has served as a studio critic at Virginia Tech and Catholic University. She was invited to create a bicycle tour of Rock Creek Park in “The Landscape Architect’s Guide to Washington, DC,” an online exhibit launched in Fall 2012.